Paldinox takes a traditional Judaica design and makes it modern with their Novell Collection’s small hanukkia in Crystal. This Hanukkah use this carved crystal menorah and you’ll see the Jewish holiday through with a clearly beautiful touch, made in Israel. 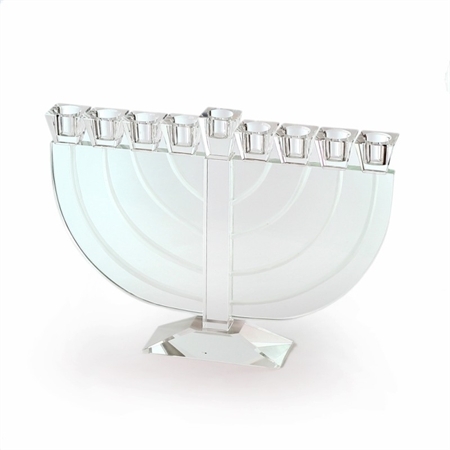 Crystal is the only material used in this piece of Judaica with a traditional design that’s been modernized to show off your lovely Hanukkah candles. The body of this hanukkia uses crystal so that it looks like there are curved stems leading up to the Hanukkah candle holders. But between the stems you’ll see that the crystal here is solid, in that the stems have actually been carved out. The candle can be carved either in the traditional curved arm design or more distinct vertical lines desgin. To give this an even modern look, the body’s crystal is frosted, giving it a slightly white look to it, reminiscent of the winter’s chill. 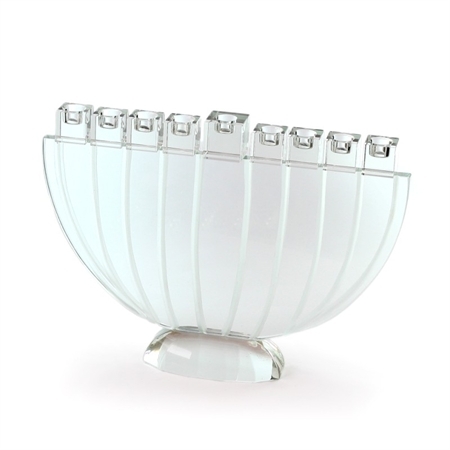 On top of this are the eight separate candle holders which are squared on the outside and polished, clear crystal. The shamash is placed in the middle and is taller than the other candle holders. The base copies this design with a piece of crystal that’s rectangular and also polished, with the two sides that are straight and two that slope down in an angle. The whole hanukkia stands only 24cm high and is 32cm wide. For a contemporary Hanukkah holiday gift or an addition to your own collection of Jewish items, this menorah is clearly the one to choose. This lovely Jewish item is made in Israel by Paldinox from their Novell Collection.